This person doesn't know the difference between slavery and indentured servitude. His knowledge of history is lacking, even of his own state. He and the other two stooges are morons. You mean the good looking one from the Bronx? Re VA's gov: believe it or not, I can actually forgive him for being so extravagantly ignorant. [The] shiny new state-commissioned textbook . . . . said slaves were happy, often referring to them as servants. It glorified Confederates. And it said precious little about women beyond Martha Washington and Pocahontas. . . . . The book was "Virginia: History, Government, Geography," and it was one of a trio of state-commissioned texts – the others were for fourth grade and high school – that taught Confederate-friendly "Lost Cause" ideas to a generation of Virginians and cast the state's segregationist political leaders in a favorable light. If you were a Virginian between fourth and 11th grades from 1957 to the 1970s, you may well have gotten a dose of this official state history. The books were estimated to reach more than a million students. . . . . This is the utter garbage that passed for history in Virginia not too awful long ago. It's a prime example of how public education has been corrupted by purely political concerns. Don't think for a second that Virginia was unique in that -- or that it was only a Southern thing. It's been going on all over. Matter of fact, it still is -- in the service of all kinds of political crappola. Last edited by slick_miester; 11 Feb 19, 12:29. Reason: I can't spell. "D'oh!" There is a lot of confusion over slavery because it doesn't come in just one manifestation. Slavery existed before the African slave trade and historically it looked more like a caste or class system than a system based on race as in the southern U.S. 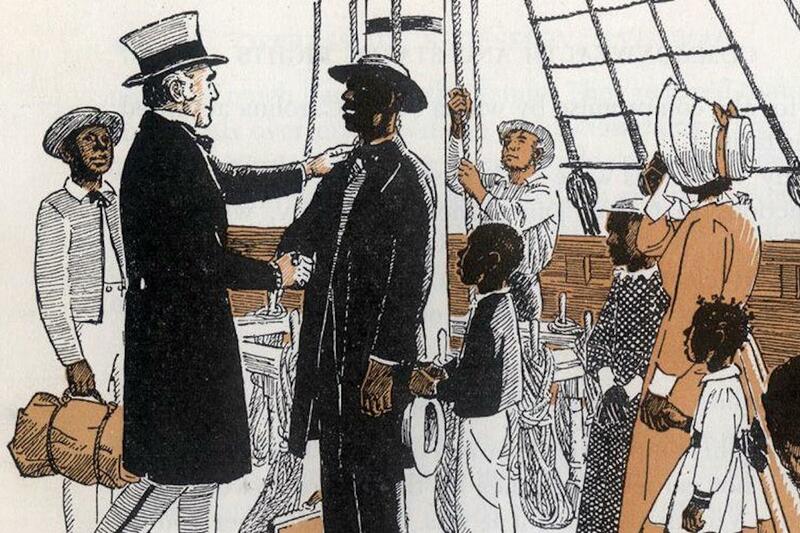 In many ways the slave culture in the U.S. grew out of traditional class structures. The Southern culture resembles nothing more than an imitation of European landed nobility. The problem of course for the plantation "nobility" was that it was becoming increasingly difficult to prevent class mobility. The answer was to create a class structure based partly on race. Black slaves could not stop being slaves locking them into an inescapable lowest caste status. To justify a slave system in an age of increasing class mobility it was necessary to dehumanize African's. That particular strategy itself was not particularly unique. In India and Japan the problem of getting people to do the nastiest work the class structure of untouchables was invented. Those structures were in many ways as rigid as African slavery but relied on the relative lack of preindustrial mobility instead of race. It is popular in some circles to suggest that slavery benefited the U.S. by providing a supply of cheap labor. The historical evidence is to the contrary. In countries where rigid class structures existed they lagged behind in economic development. The serf system in Russia did not make it relatively wealthy. The caste system in India and Japan did not make those countries relatively wealthy. In the U.S. the landed nobility system was a major obstacle to economic development which played a role in the South's defeat in the civil war. Especially in terms of infrastructure. In away we are seeing the same pattern repeat itself. Across the Western world a new caste system based on intellectual institutions is developing. The deplorables terminology could almost be a substitute for untouchables. As wealth is concentrated in the coastal elites the same old patterns of a loss of interest in infrastructure and other practical concerns has developed. The tech and financial industries are in a way analogous to the gold importation industry of Colonial Spain. Just as social status could be bought within the caste system with gold social status today can be bought with intellectual properties and financial instruments without increasing the country's tangible wealth. A half century of bread and circus has not improved the relative economic welfare of minorities any more than the Gold that poured into the Spanish crown left Spain a rich country. The lesson is that you do not become wealthy as a culture when your infrastructure including labor is in decline. The post industrial concept is as vacuous as most of what the 60s generation produced. Almost the entire wealth of the nation has gone into luxus. Extravagant housing, entertainment, luxury foods and wines, drugs, feel good educations, luxury automobiles, and ponzi schemes. Our problems are not inequality so much as a decadent class structure which includes many of the people calling for socialism. What provides meaning in life is family, productivity, and community not class status. Luxus seems to unavoidably lead to nihilism. Dont you see whats occurring here. Some Trumpers are looking for gotcha moments to unseat a Democrat in Gov Northam. Gov Northam is under fire we need to realize this. Now I disagree with Northam on abortion but that is a worldwide issue. Massena my friend this is not the way forward. Omar voiced criticism of Israel as she would with Saudi Arabia. There is no religious bigotry from Omar, the anti Americans want good folk like you to believe there is perhaps to distract us from real world issues directly affecting our fellow Americans like jobs. To all readers, Omar actually was at the SOTU address and cheered for Trump on points all Americans can agree with. Omar stood clapping numerous times for Trump. The anti Americans are going to lose and freedom will prevail. Well I just saw a report that Omar has apologized for comments that were not anti Jewish. Omar seems to have caved into Democrats that she felt had power and sway. Omar will not be getting my support. There is always hope, people can change for the better hopefully Omar does this. Democrats shouldn't give gotcha moments for them to use against them. It's so simple. No one should engage in gotcha moments whether GOP or Democrat. I agree with you. Some Republicans wouldn't mind Northam sticking it out. It will make for a good side show the next 2 years. I'm surprised he's not being forced out. It appears they are going into damage control mode. This tells me Northam is being allowed to stay put. No, he's just a dumbazz.